Starting in 1970 as an independent label, CTI Records produced jazz music that was artsy, hip, ambitious and accessible. In one instance, its artists could record very straightforward jazz music and in other produce something that was more R&B/funk-oriented suitable for mainstream consumption. The eclectic nature of the music of CTI, founded by Creed Taylor, is captured wonderfully on this 4-CD set compilation spanning the first half of the 1970s. The music is arranged here thematically: Disc One centers on the more, familiar straight-ahead jazz music that was still traditional with familiar stalwarts such as Ron Carter (“So What”), Randy Weston (“Ifrane”) and Stanley Turrentine (“Sugar”). Disc Two focuses more on the very groove-oriented cuts like the very disco-influenced “What a Difference A Day Makes” by the late Esther Phillips and George Benson’s funky take on Jefferson Airplane’s “White Rabbit” as well as a souped-up version of Also Sprach Zarathustra (“2001” Theme) by Deodato. 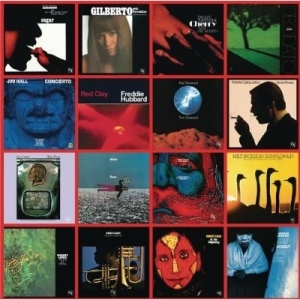 The muic on the third disc pays homage to Brazilian music, which of course features the legendary king of bossa nova, Antonio Carlos Jobim, on two cuts (“Stone Flower,” “Brazil”) as well as mjsic by Airto and Astrud Gilberto. The last disc centers on the smooth and West Coast jazz styles from the duet of Gerry Mulligan and Chet Baker on “My Funny Valentine” through Bob James’ “Westchester Lady” through George Benson’s distinctive fluid guitar lines on his cover of Dave Brubeck’s “Take Five.” Looking at the personnel that was on these records, there was considerable overlap in terms of the musicians (like Ron Carter and Deodato) used that it kind of gave the sound–as diverse as it was– an recognizable identity and stability. And let’s not forget those cool CTI album covers, as Dan Oullette points out in his liner notes to this very well-packaged set that further gave the records that sense of hip visually. As far as jazz labels are concerned, CTI is certainly right up there with the giants like Verve and Blue Note in terms of influence and stature—you can’t get more ‘70s as CTI.